She calls the school's policy "racist and gendered." A Texas elementary school is being accused of racist policies after asking a 6-year-old boy to cut his hair, which he wears in dreadlocks. 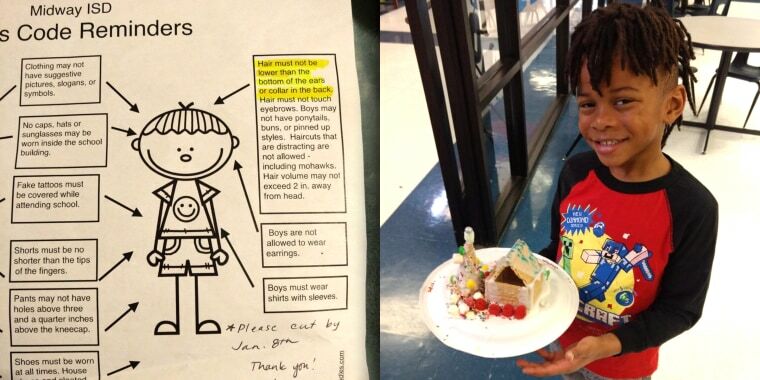 It all started late last month when Jonathan Brown, a student at Spring Valley Elementary School in Hewitt, Texas, was sent home with a flyer outlining the school's dress code policies. Officials at the school highlighted a specific part of the dress code outlining which hairstyles are allowed and the boy's mother, Tiffany L. Brown, later posted the flyer to Twitter. Officials describe the school's hair policy as follows: "Hair must not be lower than the bottom of the ears or collar in the back. Hair must not touch eyebrows. Boys may not have ponytails, buns or pinned up styles. Haircuts that are distracting are not allowed - including mohawks. Hair volume may not exceed 2 in. away from head." After reading the memo, Brown said she was concerned that her son was being asked to cut his hair. "My initial reaction was shocked! I felt upset and targeted," she told TODAY Style. "My son's hair is part of him. It shows his individuality. It's his confidence and comfort." On Twitter, the mother called the school's policy "racist and gendered," and went on to write: "I signed up for a great education for my children. I won’t conform to racist policies." Prior to receiving this request, Brown said her son had never been warned that his hairstyle was against school policy. Before sending her child back to school after the holiday break, Brown told him what the flyer meant. "I explained the information to him. He began crying and whining about it. He didn't want to get his hair cut. He said, 'I love my hair; I don't want you to cut it,'" she said. When Brown sent Jonathan back to his classroom with his hair intact, the first grader was soon called into the school office. While discussing his Christmas break, a school official started talking to Jonathan about his hair, revealing that she'd seen him and his mother discussing his dreadlocks on the local news. "While talking to him on the drive home, he was confused and in distress. My son told me that the assistant principal said she saw him on the news. Then my son paused and asked me not to talk mean about people on TV. After the conversation with his assistant principal, Jonathan wanted his hair cut. He went from loving his hair one day to hating it within 24 hours," Brown said. A spokesperson for Midway ISD, the local school district, told TODAY that multiple children were sent home with a similar flyer before the holidays and explained that dreadlocks aren't specifically an issue. Rather, the length of hair is what poses a challenge to the school's dress code policies. "Midway ISD has implemented dress and grooming standards for decades. The policy is established to teach grooming and hygiene, prevent disruption and minimize safety hazards. Even when the policy has incrementally evolved through revisions over time, the length of male students’ hair has been a subject of periodic debate over several decades. In other words, male students wanting to have long hair is not new," the spokesperson wrote in an email. "Nevertheless, what IS new is a social media claim this past weekend that Midway’s hair code is racially discriminatory. Since the code applies to all students, it is not discriminatory in intent or by legal standards. Students are expected to adhere to the current dress code, which was acknowledged by every student’s guardian at registration." Since sending Jonathan back to school, Brown said she's briefly met with school officials, requesting that they refrain from speaking to her son in private regarding this matter. At that time, she and her husband were informed of a new deadline (Jan. 14) for her son to cut his hair. "Since we have not cut Jonathan's hair, our son has now been punished. Jonathan has been placed in in-school suspension because we, his parents, decided not to cut his hair. Jonathan has done nothing wrong. ISS for Jonathan is him sitting in the principal's office to do his classwork," Brown said. Removing him from his typical learning environment, because I, the parent, choose not to cut my son's hair. He now has a school record. As of 1/14, my child has been punished with ISS, In School Suspension, until his hair is cut. The Midway spokesperson said the school has an open door and is committed to discussing this situation with Jonathan's parents: "Any parent may submit documentation to the campus administration requesting a possible exemption to the dress-and-grooming standards for a sincerely held religious belief. These letters are reviewed carefully by campus administration and determined on a case-by-case basis." As for Brown, she's hoping the district will reevaluate their policies moving forward. "I hope Midway ISD will make the necessary changes needed to ensure equality across the board. That includes race and gender. Midway ISD can be great, but must be willing to make positive changes for the betterment of all of our children and society as a whole," she said.